or when you feel so bored with your existing styles.. what i do is flip through magazines! and my favourite has to be JILLE. i buy it every month. can you get it in singapore? after exploring almost all the japanese mags like Nonno (too sweet and cute and young for me), Soup, Cutie (too cute), Sweet (too sweet) Vivi, CanCan, JJ, With, mina, Ray,PS (more too mature and too OL style for me), Kera and Zipper (when i feel like being a little too alternative)..... my second favourite is Spring and then followed by Mini. they inspire me to do different combinations, for eg. like camisole. which is something very common, but take a look at how they are worn in the new way! you can combine it with a capped sleeve t-shirt instead of just wearing it on its own. layering makes it interesting! 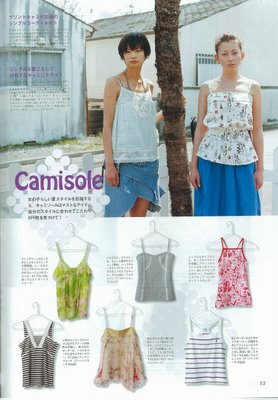 try camisole over tank top, or camisole over camisole, floral over stripes, clash them! have fun! go wild! watashiwa kinyobi ni jeanasis ni ikimasu! what i like about shopping in japan..